Asbestos roofs are an issue for many homeowners in Brisbane. Due to the risks of asbestos, it can be challenging to find a solution. If you’ve started your search online for terms like, ‘Asbestos Roof Replacement Brisbane‘ or ‘Asbestos Roof Removal Brisbane‘, then you need to find the safest and most professional company in Queensland. Fortunately, the team here at Strongguard specialise in the safe replacement of asbestos roofs. Asbestos is a brittle material, which means that it often cracks, causing leaks and mould. As a homeowner, you are limited in who you can hire to remove asbestos, because of its hazardous nature. Often, people can’t find Brisbane roof repairers willing to work on their asbestos roof. In addition, few or no solar electricity specialists are prepared to install solar panels on an asbestos roof. At Strongguard however, we’re licensed and trained in the safe removal of asbestos. We can remove your asbestos roof and dispose of its safely. We can also replace it with brand new COLORBOND® or ZINCALUME® metal roof. When you choose a reputable roofing company like Strongguard, you can expect safe working practices and quality workmanship every time. Our aim is to eliminate both the health risks and maintenance challenges that asbestos presents. When dealing with asbestos roof removals, it’s important to remember that there are many regulations surrounding its removal. For your benefit, and our own, we are familiar with local regulations and safe practices when it comes to asbestos. 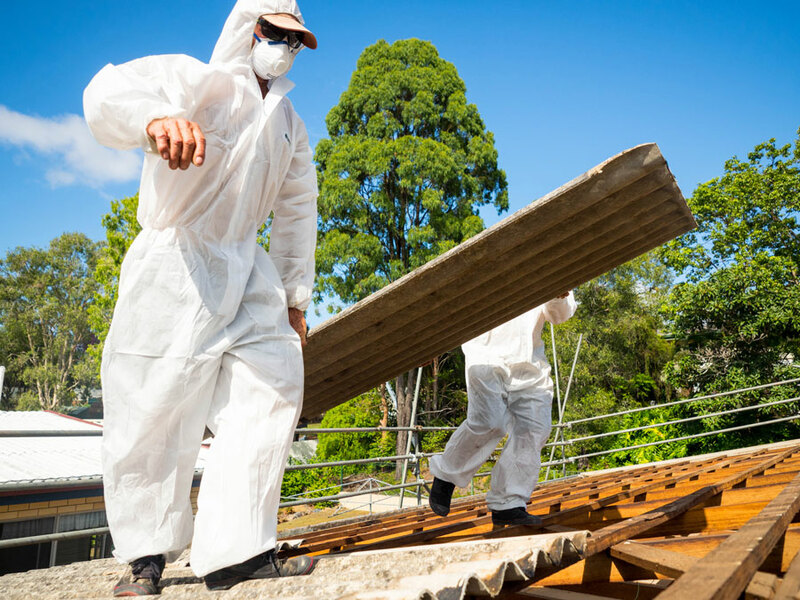 Our entire team of Brisbane roofing contractors are trained (Course CPCCDE3014A – “Remove Non-Friable Asbestos”) and licensed in asbestos management. This means that you are in safe hands when you choose Strongguard. We will ensure that all asbestos is removed from your roof safely. To do this, we make sure that all asbestos removal complies with the law. Asbestos roof removal improves your safety and peace of mind. It can also decrease the cost of your home insurance and add value to your property. Once all asbestos is removed from your roof, we will be sure to dispose of it quickly and safely. Following this, we can install your brand new roof. A new metal roof from Strongguard will offer superior quality, durability and looks. Here at Strongguard, we’ve developed a specific process to remove asbestos roofing from your property. Our priority is your safety and the safety of our tradesmen. For this reason, we ensure that all of our workers have completed the training necessary to manage asbestos. As a part of this, we are all licensed to undertake class B asbestos removals. The first step of our process is to carefully remove the sheets of asbestos from your roof. Asbestos is at its most dangerous when it breaks. This is because breakages cause the asbestos particles to become airborne. For this reason, we lower it very slowly to the ground using a mechanical lift or by hand. Once the asbestos is out of your roof, we will thoroughly clean your ceiling cavity. We do this with a purpose built industrial asbestos vacuum cleaner. As an additional safeguard, we treat your ceiling using a PVA sealing solution. Before we can dispose of the asbestos, we must pack it appropriately. To do this, we take one of two approaches, depending on the circumstances. The first possible approach is stacking the asbestos sheets and wrapping them in black plastic. The second possible approach is to place them in a lined skip bin. When this stage is complete, we can contact a licensed asbestos transporter to remove it. When all asbestos has been dealt with, we will organise a third party clearance inspection. We will also supply you with the report that is created during the inspection. Finally, we can commence the installation of your new roof. To do this, we check and re-screw all timber battens. Following this, we install insulation as necessary, then fit your new COLORBOND® or ZINCALUME® steel roof. 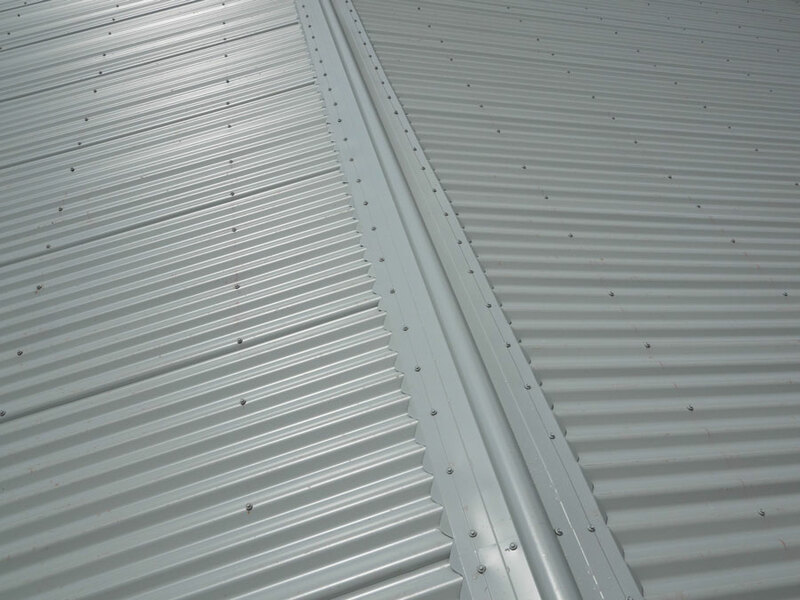 The roof includes brand new scribed capping, valleys, flashings and fastenings. If you have asbestos in your roof and aren’t sure how to deal with it, then contact Strongguard today. We are asbestos roof removal specialists, with all the necessary licences, training and experience. 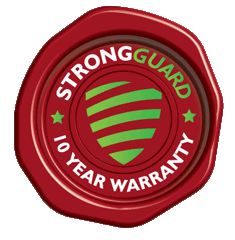 You can rest assured that Strongguard can help with your asbestos roof issues. Simply give us a call today or contact us online, and we can discuss your asbestos roof removal. #1 Do I need to move out while you remove and replace my asbestos roof? In most cases, you will not have to move out of your home while we’re completing the job. We do, however, strongly recommend that you close all of your windows and doors. You should probably also head out for the day while we remove the asbestos itself. While we remove the asbestos from your roof, safety is our foremost priority. To ensure that you are at no risk whatsoever, we suggest that you stay clear of the site as the asbestos is being removed. We take all the necessary precautions to ensure everyone’s safety during the process. Despite this, it is still best to keep your distance. Our sites are set up in accordance with strict government regulations and workplace health and safety guidelines. With this in mind, you can rest assured knowing that we have everything covered. You probably won’t have to leave for more than a single day. There shouldn’t be any need to make alternative accommodation arrangements. You can return to your home safely once the removal process is complete. We will fill you in on the finer details prior to the commencement of the asbestos removal. #2 Do the neighbours need to know what is going on? Workplace health and safety regulations require us to inform your neighbours of any asbestos removal. This is important as it ensures that they know to keep their distance while we complete the removal. However you don’t have to worry about this, as we will inform your neighbours ourselves. We do this in accordance with local regulations. Our team will send them the relevant details by post, so that they know when work will begin. It is also important that we notify the Department of Workplace Health and Safety. This department is responsible for maintaining the strict safety standards of asbestos management. To do this, it is important that they are aware of any asbestos removal jobs. Don’t worry though; the team at Strongguard has you covered. We will notify all the relevant parties and ensure that we meet our legal obligations. #3 Can you repair and paint my asbestos roof? 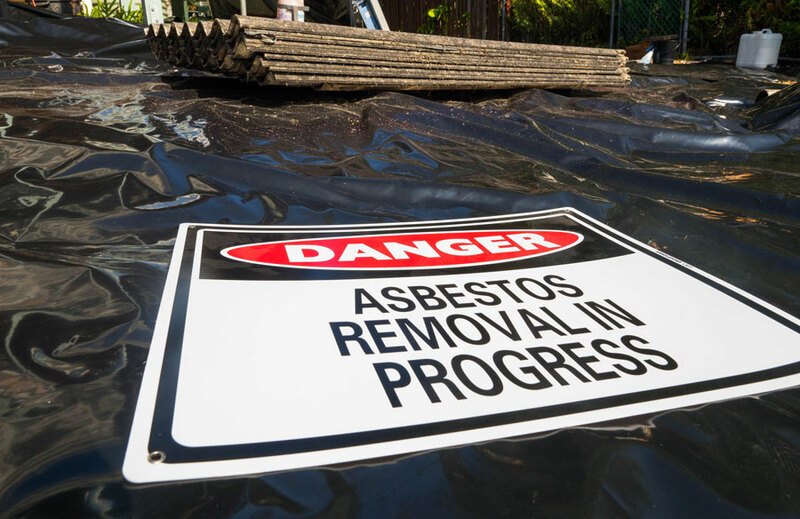 Repairing an asbestos roof is unsafe for a number of reasons. Most notably, repairing a roof normally involves drilling and other such procedures. If we drill into an asbestos roof, particles of asbestos dust will become airborne. This is extremely hazardous to all involved. For this reason, we do not offer repairs for asbestos roofs. Instead, we only offer Brisbane asbestos roof removal and replacement services. Even if you disregard the safety implications of repairing and repainting asbestos roofs, there are still issues. For example, asbestos does not have a suitable surface for roofing paints. Asbestos roofs are often old and deteriorated. This means that their surface is quite loose and uneven. As a result, conventional roofing paint is unlikely to adhere to the roof. Consequently, the paint job would be very poor. #4 What will happen to my ceiling insulation? All of your ceiling insulation will have to be removed during the asbestos removal process. When we remove asbestos, we must do so to a very high standard of safety and quality. This is necessary under government regulations. When the job is complete to an acceptable standard, our third party assessor will inspect and issue us with an asbestos clearance certificate. To meet the strict criteria of this certificate, we have to remove all existing insulation. After this, we vacuum the ceiling and spray it with PVA glue. For these reasons, we do have to remove all insulation. To make this easy, please let one of our estimators know as soon as possible if you have insulation. #5 Is your asbestos roof removal process safe? Here at Strongguard, your safety and our safety is the number one priority. As a part of this, we adhere strictly to the Asbestos Removal Code of Practice. All of our roofing specialists are trained and licensed when it comes to asbestos roof removals. This means that you will get a professional job, completed to the highest standards of quality. We also ensure all work is done in line with all workplace health and safety regulations.